Hey there. As most of already know, you cannot drive with your cell phone in your hand. Many of us have gone around this by wearing bluetooth headset to talk on the phone. But what if you need to interact with the phone while you are driving? Say... while you are using your GPS system? Our friends at Aukey have your back! 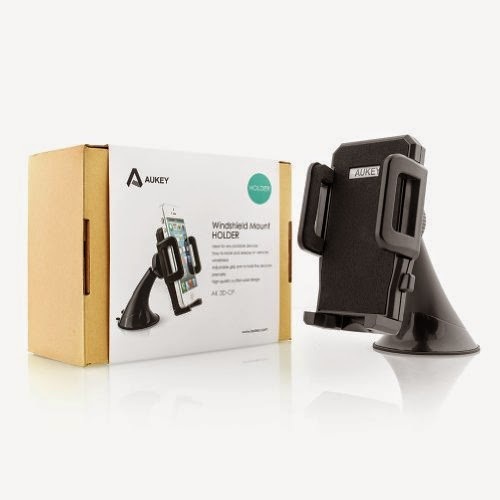 Check out this awesome Aukey AK-3D Universal Smartphone Car Holder! Aukey was awesome enough to provide me with one of these bad boys to try out and review. So without any further delay, let's get right into it. There are 3 features of the Aukey smartphone holder that really makes it worth getting: the suction cup, the swivel, and the expandable arms. Let's start off with the suction cup. I've seen more than a few smartphone car holders use some sort of clamp or some sticky stuff to attach the holder to your windshield. The Aukey AK-3D does not. It has this suction cup that definitely does its job! I've had a history or hit or miss with suction cups so I was a bit discouraged when I saw the suction cup. I was expecting it not to stay, I was expecting to have issues, I was expecting to not use the Aukey smartphone holder as much because I would get tired of it falling off my windshield. It's been weeks and it has yet to fall off. That is freakin' awesome! So how did Aukey do it? With a little bit of ingenuity. There is a level at the base of the Aukey smartphone holder that literally "pushes" the air out from under the suction cup. The less air in between the suction and the glass, the stronger the hold. And when you are ready to move your Aukey smartphone holder, you simply reverse the lever and you can literally peel it right off. Genius! That alone makes this worth getting. "But Metallman, that sounds cool and all but what if my smartphone doesn't fit?" There's a reason why it's called a universal smartphone car holder! Check out the width of those arms! The Aukey Universal Smartphone Car Holder is waiting to bear hug your phone! A phone that is up to 4.5 inches wide can fit in there. That means that even if you have a wide Samsung Galaxy Note 3, you will still be able to use this Aukey Smartphone Car Holder! You can extend the arms of the holder by pressing a small button. Once you have your phone in place, you can retract the arms to close in on your phone and lock it in place. The mechanism is simple yet extremely effective. If you ever played with those toy handcuffs as a kid, you'll be familiar with how the locking and releasing or the arms mechanism works. Plus, you will not have to worry about damaging your phone since the inside of the arms are lined with padding. You can rest assured that your phone will be well secured with this locking arm mechanism and a strong suction. Suction tab in the release position and a good view of the ball joint to swivel. Now, the swivel action is just the icing on the cake. You can swivel the Aukey AK-3D in practically any which way. The ball joint in the back allows for a full range of motion. And once you've found your desired position, you can lock it in place by turning a small ring in the back. Again, Aukey not only has comfort and convenience in mind, but they are making sure that your phone is securely locked into their device to give it maximum protection! Now, this is advertised as a universal car hold but you know what... it works just as well on a desk. I'm a blogger, I'm a writer, I spend most of time at my desk near my laptop and every now and then, I will need to move from my position to check my phone for social media updates and Emails. With this Aukey AK-3D Universal Smartphone Holder, I can have my phone secured to my desk and face me! Check it out! Don't get caught with your phone in your hand while driving. Get this Aukey AK-3D Universal Smartphone Holder and avoid those costly tickets. It's easy to use, it's extremely convenient, it secures your phone, and best of all, it's only a couple of bucks. This usually runs for about $20 bucks but if you act quickly, you may end up getting for under $10. As of this posting, you can pick it up for only $7.99 at Amazon. A great price for one extremely convenient product! And just if you're still a little iffy on getting one, check out my video review for a good look on how the Aukey AK-3D Universal Smartphone Holder works. Later!